Is booking travel stressing you out? If you already have a travel policy in place, there are ways to make it even better. 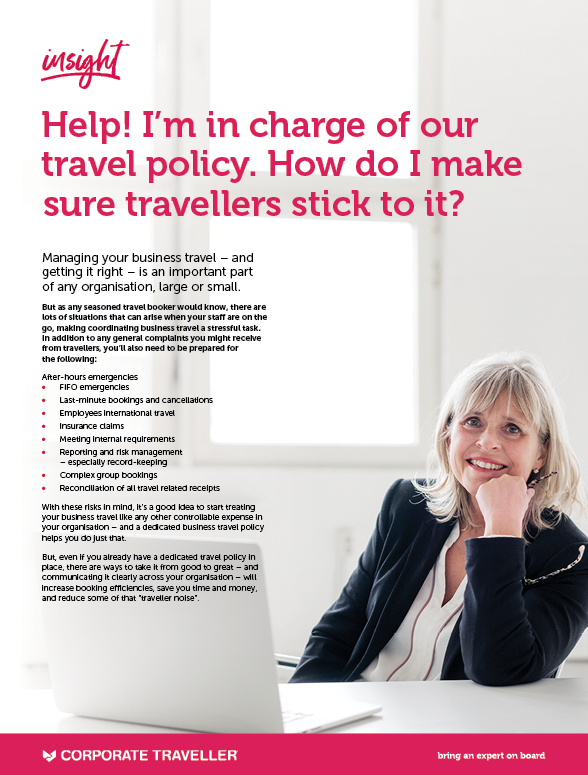 Managing your business travel – and getting it right – is an important part of any organisation, large or small. But as any seasoned travel booker would know, there are lots of situations that can arise when your staff are on the go, making coordinating business travel a stressful task. We’ve put together an eBook filled with advice on how to create or extract even more value from your policy – and start making your business travel process more productive. Download and read the eBook ‘Help! I’m in charge of my travel policy. How do I make sure travellers stick to it?’ today.